The AAG awarded the Gold Medal to Dr. Gerry Govett at the 24th International Applied Geochemistry Symposium banquet in Fredericton, New Brunswick, Canada. Gerry Govett (right) and David Cohen (left) at awards banquet. I am deeply honored to give the citation for this year's recipient of the AAG Gold Medal, Dr. Gerry Govett. It seems highly appropriate that this award would be presented at this university where Gerry spent a good part of his career, at this IAGS symposium 33 years after the first regional symposium organized by Gerry and his graduate students, and in the presence of so many former colleagues, students and close friends. Gerry is highly deserving of this award as most of you who are familiar with his prodigious research already know. Govett's career spans almost 40 years from the time he received his Ph.D. in 1958 from Imperial College in London, UK, until he retired in 1996 from the University of New South Wales in Sydney, Australia. During this career, Gerry was a research scientist at the Alberta Research Council, Professor and Director of Graduate Studies at the University of New Brunswick, and Professor, Head of the School of Applied Geology, and Dean of the Faculty of Applied Science at the University of New South Wales in Australia. He has inspired a generation of undergraduate and graduate students from almost every continent with his energy, enthusiasm and the scientific rigour of his ideas. Gerry's academic career was also interspersed with periods as consultant to the United Nations Development Programme, international mining companies including Anglo-American, Bethlehem Steel, Dresser Minerals, Chartered Exploration, AMAX, Preussag, Esso, CRA, and smaller companies in Canada and Australia. He has had extensive exploration experience in 15 countries including Australia, Canada, Ethiopia, Fiji, Finland, Greece, Guyana, Jordan, Indonesia, the Philippines, Papua New Guinea, Turkey, Zambia and Zimbabwe. He was also geochemical adviser and consultant to the Geological Surveys of both Greece and Finland, and Director of Delta Gold Limited. Gerry served on the editorial boards of Resources Policy, the Journal of Geochemical Exploration, and Exploration and Mining Geology. He was a founding member of the Association of Exploration Geochemists and served on Council, including a term as President. 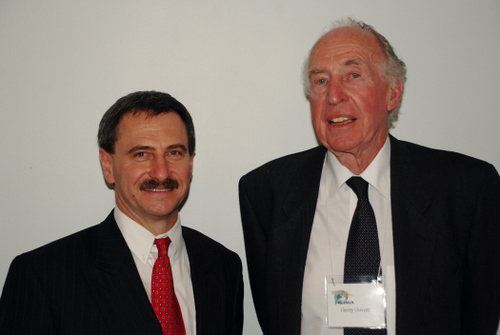 Gerry was also a member of the Canadian Geoscience Council, Councilor for the Australian Mineral Foundation, and founding member of the Australian Geoscience Council on which he served as both Vice-President and President. Professor Govett has an enviable publication record that comprises more than 90 significant papers, as well as authored and edited books on mineral economics and exploration geochemistry. He also conceived here at UNB the Handbook of Exploration Geochemistry and was Series Editor from 1974 to 2001. One of Gerry's greatest talents was a natural creativity and an ability to anticipate future developments in the field of exploration geochemistry. To give you an example, Gerry was already discussing the decline of base metal reserves in established mining camps and exploration methods that could see deeply into the Earth's crust 30 years before the GSC finally got around to funding a Deep Search research project. Another example of Govett innovation is the role of electrochemical fields that develop around ore deposits in the generation of surface and near surface soil geochemical anomalies. Gerry was not content to just measure the classic "rabbit ear" anomalies in soils but insisted that we undertake elaborate tank experiments at UNB. I well remember tank experiments on sulphides in a porous sediment medium pierced by a complex array of platinum electrodes connected to more switches for measuring potential fields than you would see on the flight deck of a modern jetliner. Thank heavens for Radio Shack. For those of you who were not at Gerry's talk on Monday, the tanks came in different shapes and sizes and can best be visualized as pots or fish tanks with a tangled array of wires going everywhere. I would like to finish on a personal note. I first met Gerry in 1968 or 1969 when he was invited to Mount Allison University where I was an undergraduate in geology to give a lecture, not on exploration geochemistry, but on archaeology. Gerry had marshaled a lot of evidence to support the idea that the caldera at Santorini in the Aegean Sea was the site of lost city of Atlantis. After the talk, we gathered at the home of John Moore, who was head of the Geology Department, where I believe we met for the first time. Later on, I was recruited by one of Gerry’s graduate students, Bob Whitehead or whom Gerry like to call "young Robert" to undertake a Ph.D. thesis on the Brunswick No. 12 base metal deposit in the Bathurst Mining Camp. The UNB geology department back in those days was a bustling hub of activity with two economic geologists and two exploration geochemists in a group of over 20 professors. Gerry's graduate students resembled a mini-United Nations originating from all over the world - Greece, Finland, Turkey, Malaysia, Philippines, Canada and the U.S. to name a few. And it is great to see so many of them here this evening. The Exploration Geochemistry Group was a rather close knit fraternity and had its own building, the Geology Annex across the road from the main geology building which we shared with the drafting/photographic group and the thin section preparation lab in the basement. Gerry was always very kind to his students, inviting them to receptions at his home when speakers were in town and commonly to Thanksgiving dinners prepared by Marjorie Govett who was an amazing cook not to mention a highly accomplished Economist. I have very fond memories of those get-togethers just down the road from here on Lincoln Road that runs along the St. John River where Gerry designed and had built his home (Many of you would have passed by Gerry's home on Lincoln Road on your way in from the airport). My wife, Marianne, and I rented an apartment on Lincoln Road and you could almost set your clock to the minute when Gerry and Marjorie drove by on their way to the university each day in their green Camaro convertible, of course with the top down in the summertime. Gerry kept a highly productive vegetable garden and even offered space in his garden for Marianne and me to grow tomatoes. However, since I was in the field during the summer and Marianne did not have a car..…at least that was the excuse we used….it was left to Gerry to do most of the weeding. Of course, this did not prevent us from showing up in late summer when I returned from the field to harvest our tomato-laden plants in "our garden"! Gerry left UNB in 1977 for a position at the University New South Wales in Australia with the intention of returning in five years. As so often happens, Gerry had put down roots in Australia and the rest is history. You might say that Canada's loss was Australia's gain. As many of you may know, Marjorie Govett passed away in 1990 in Greece and Gerry subsequently married Idelies whom he had known at the University of New South Wales and who is here this evening on her first trip to Fredericton? I had the pleasure of meeting Idelies on Sunday, however through the letters that accompanied the Govetts' Christmas card each year describing the trials and tribulations of homesteading in Australia, I felt we already knew her. Gerry and Idelies retired in 1996, bought a piece of land in the Southern Highlands of New South Wales and, true to form, designed a "house for two" as described by Gerry with lots of space for books and a large underground cistern with 100,000 liter capacity to collect rain water, the only source of water. Now if you are thinking that this "house for two" may seem to have been designed to exclude visitors, you will be relieved to know that Gerry has a shed out back for such purposes. Actually, it is not as bad as it sounds. Gerry has renovated the shed – "insulating it, putting in walls and ceiling" – and it is now a very comfortable bed-sitting room, with bathroom, for visitors. From the foregoing, I fear that I may have given you the wrong impression that Gerry has led the perfect life as a highly successful geochemist, designer and builder of homes, and gardener extraordinaire; ……well I want to dispel you of that notion right here and now. And to do this, I am relying on a direct quote from Gerry based on their experience homesteading in the wilds of New South Wales. To quote - "We planted 8 fruit trees in 1997 before house building started. Until the first fruit appeared in 2000 we never saw a parrot here. Then, they came from nowhere in their hundreds. Visitors gaze in wonder at these multi-coloured beasts. We have other views!" I don’t know if Gerry has brought out the artillery yet but clearly these "beasts"….not birds but "beasts"….are far from welcome. The good news is that they persevered and seem to have won out over the ravenous parrots. To quote again: "Anyway, we now have about 30 fruit trees, mostly apples, plums of various kinds, quince, and pears." What is not clear, however, is 1) the current size of the parrot population in the southern highlands, and 2) how the fruit is shared among the Govetts and their feathered friends (Let me do some math: if 8 fruits trees attract 100’s of parrots, 30 fruit trees probably attract close to 1000!). There must be a UN program, perhaps a save the parrot program, to recognize the Govetts contribution to local parrot population. The garden also includes raspberries and black currents and the original bull paddock has been landscaped with trees and shrubs and roses. Needless to say, the traverses across rocky outcrops and alder swamps collecting samples for geochemical studies must seem a faint memory at times, as Gerry drives around in his Kubota tractor with its front end loader piled high, you might say, with the fruits of his labour. In conclusion, I would ask you to join me in congratulating Gerry for a remarkable career and offer our best wishes for many, many more productive years in Highlands of New South Wales.